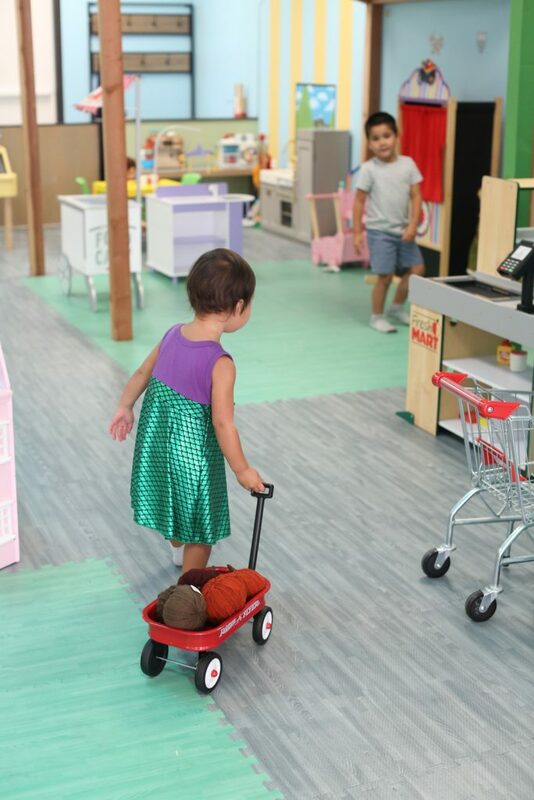 We’ve been hiding some of these gems for our March pretend play in our storage closet since November and we’re so happy to unveil superhero dress up for this month’s change up. 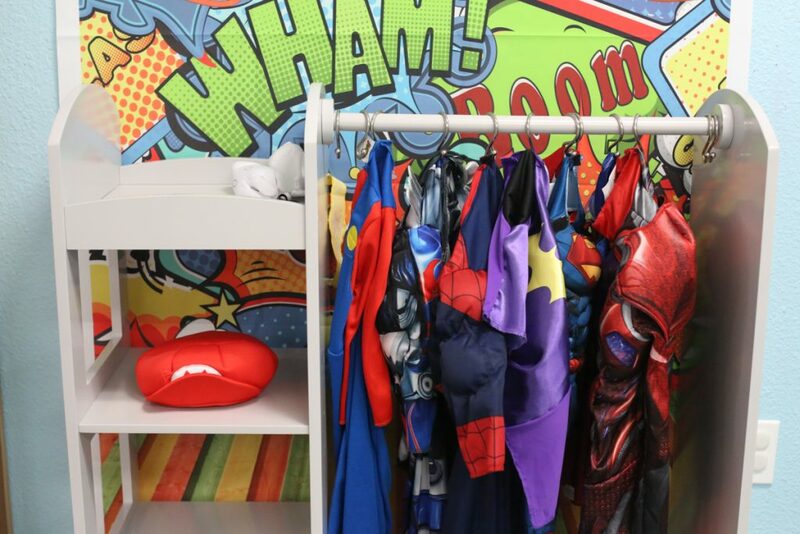 The area is decked out with a superhero backdrop and a wardrobe closet from guidecraft. 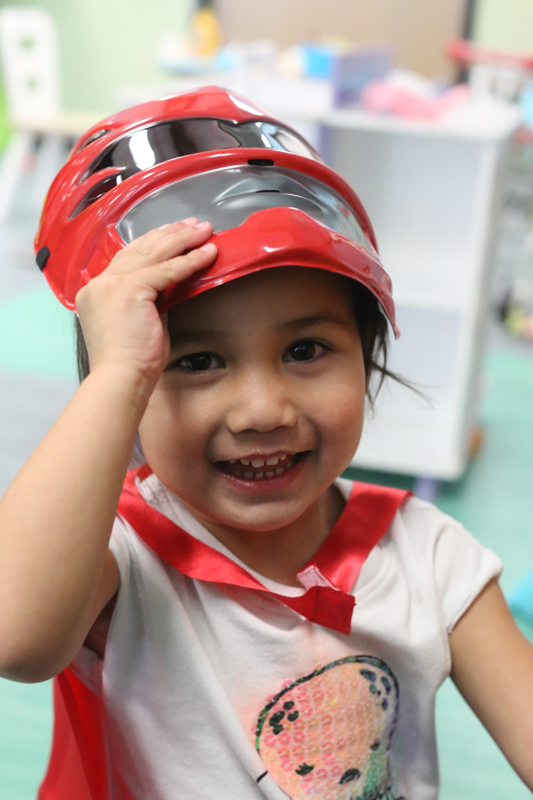 The kids have several options for Superhero dress up they can choose from, including power rangers, super mario, batgirl, supergirl, spiderman and more. 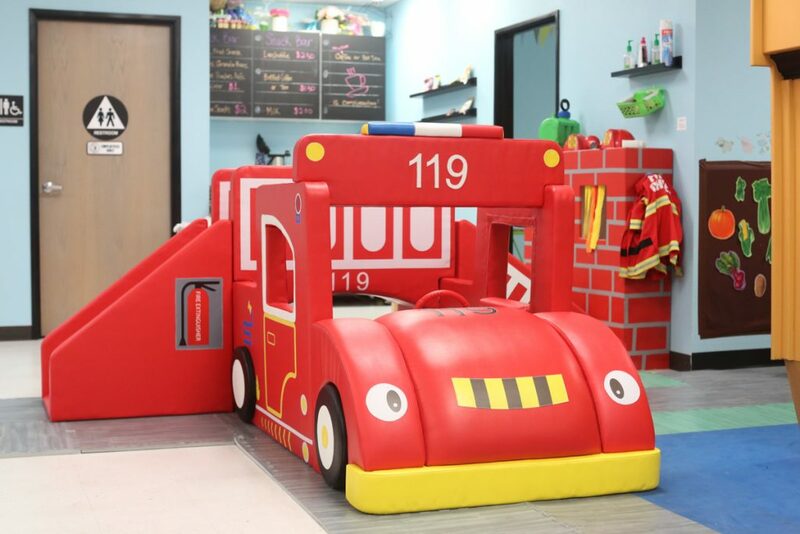 The play area also includes some masks, hats and other corresponding accessories for the kids to live their best superhero life. A superhero area wouldn’t be complete without a superhero hideout. 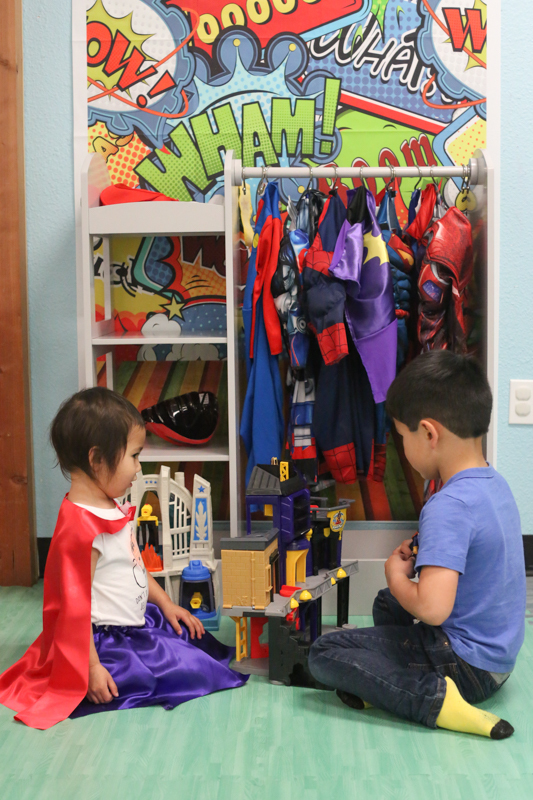 We included some dramatic play especially for those superhero who needed more action. Check out our calendar and fly on over to our lair. The main play area has transformed with two new play structures. 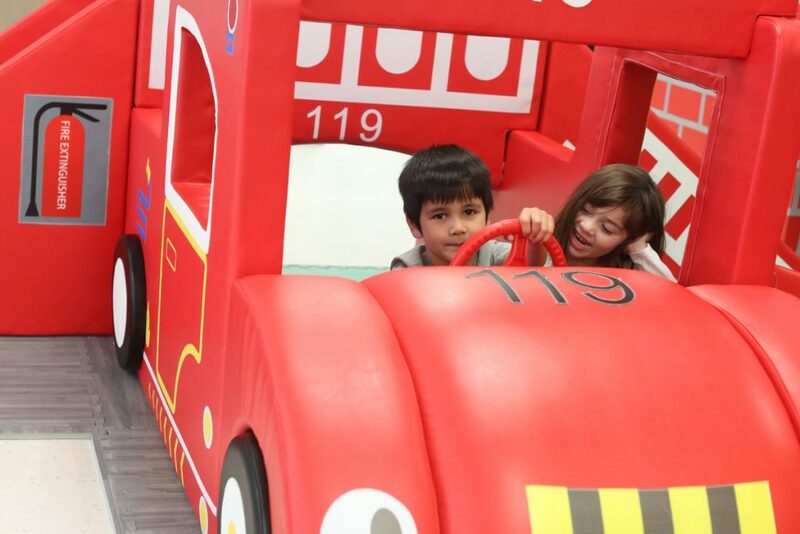 We have added two soft play areas that your children will love. Climb through the tunnels in our colorful honeycomb. 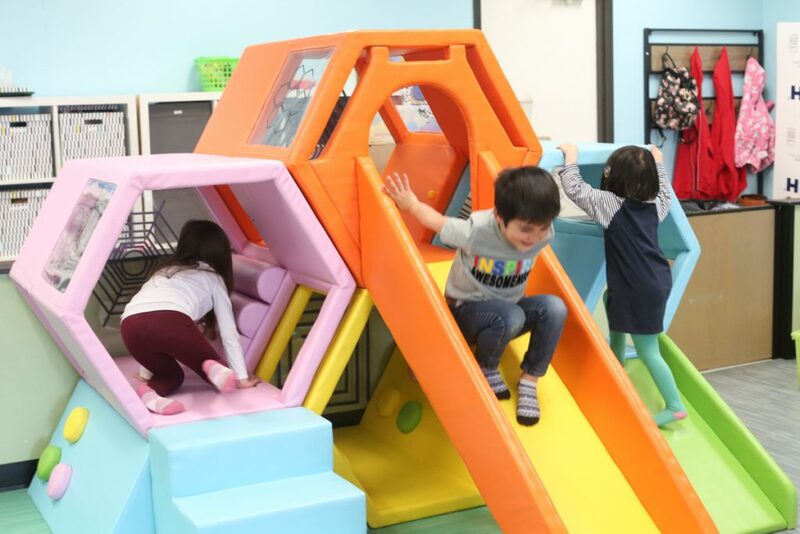 The kids will love hiding in the cubbies and going down both slides. 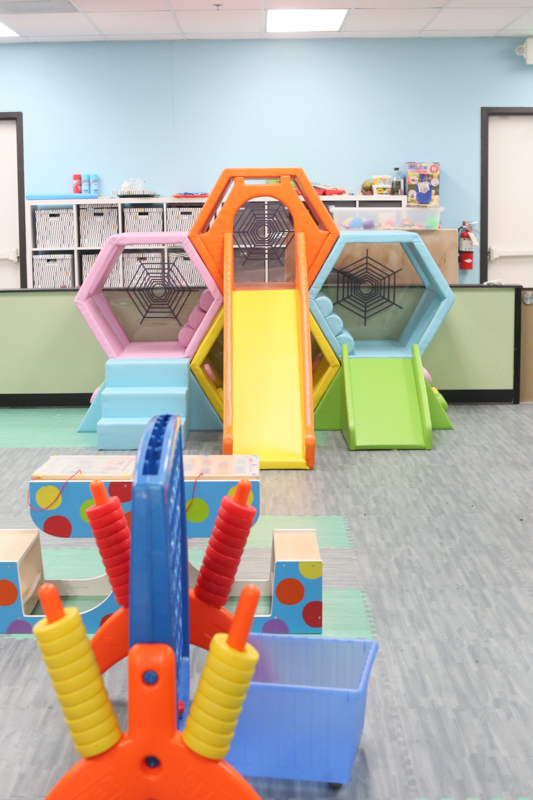 Parents will love the soft play features such as the slide that goes all the way down to the ground and the easy climbing stairs. Our fire station got an upgrade too! Check out the new fire truck! Be a real firefighter by riding inside the fire truck. Climb the stair way, go over the bridge and go down the slide. These new items are so much fun. The kids will have a blast. We’re sure of it! 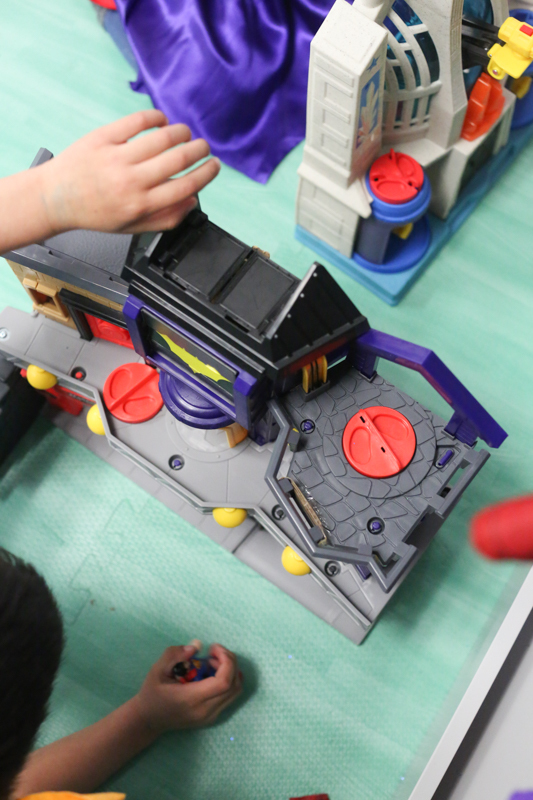 Check out this fun behind the scenes footage of the arrival our our new play equipment. 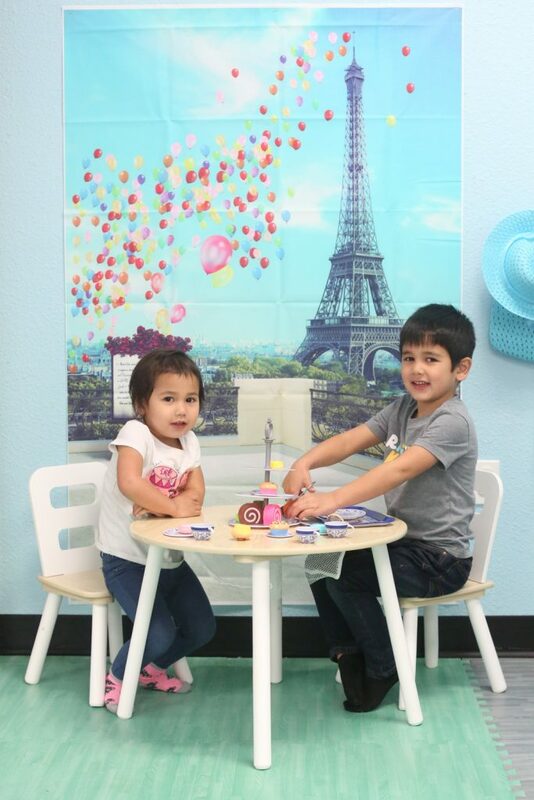 In honor of the month of love we thought we would set up a cute place for the kiddos to gather for a play date. 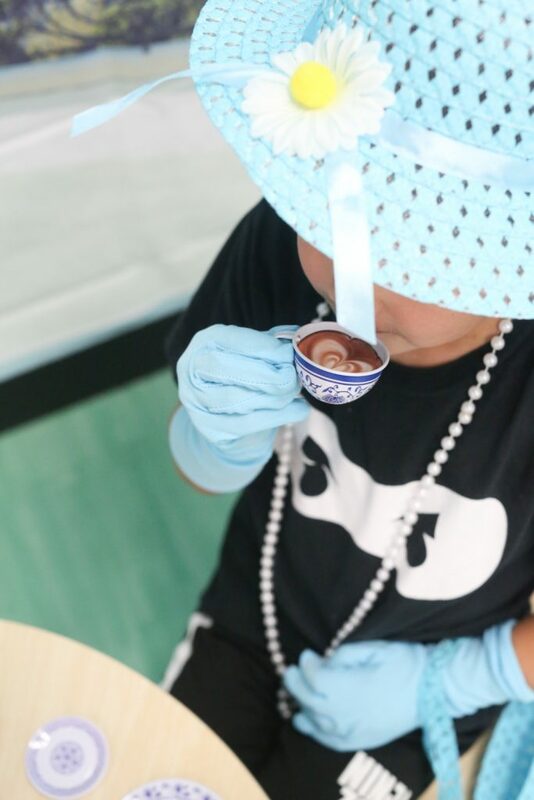 Welcome to our version of kids Parisian Tea Party. The kids get to have a Parisian experience of their own by sitting on a patio at a table for two overlooking the iconic Eiffel tower. The table is adorned with a cake stand where they can enjoy some pastries. 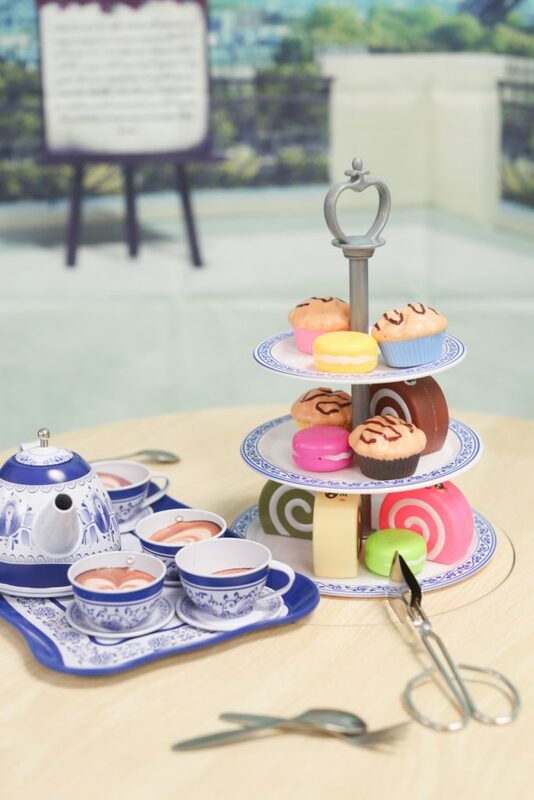 How cute are these pretend macarons and muffins? Of course, the highlight is enjoying tea in these teeny tiny china cups. We love the design on the cups and how they come with little inserts for a real life feel. 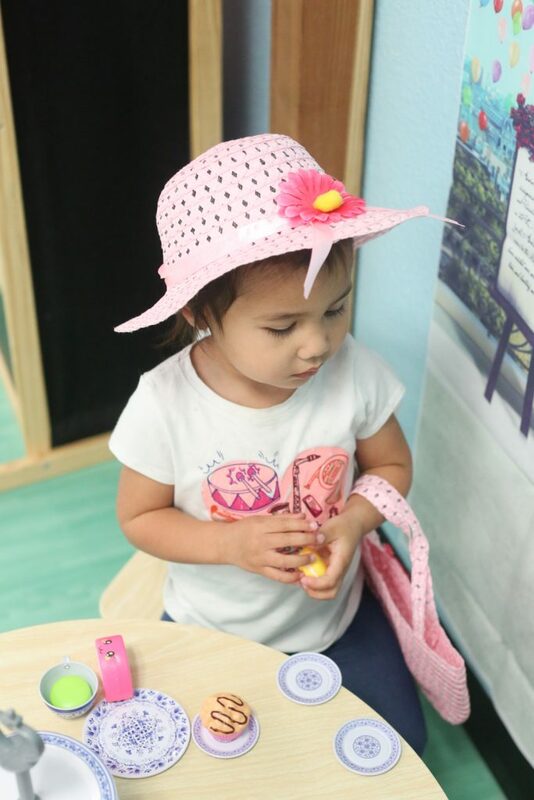 We also included some tea party dress up clothes, which includes a hat, gloves, necklace, and purse. The kids will feel fancy while they sip their drinks. 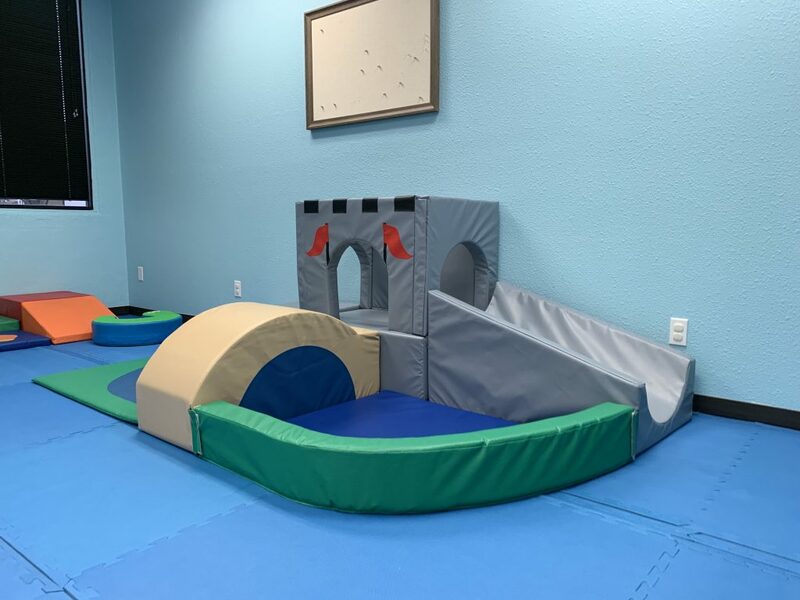 We love changing the play area every month. 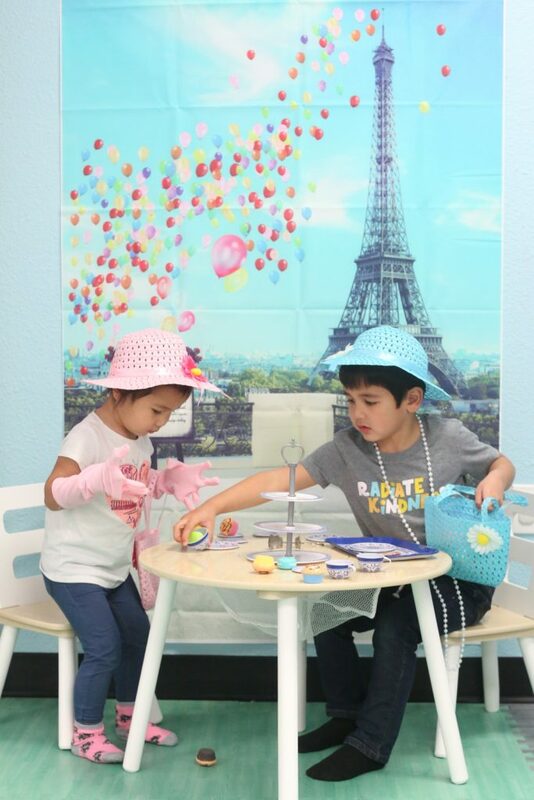 Come join us in visiting Paris and playing tea party. You can find all the toys from this play area below. 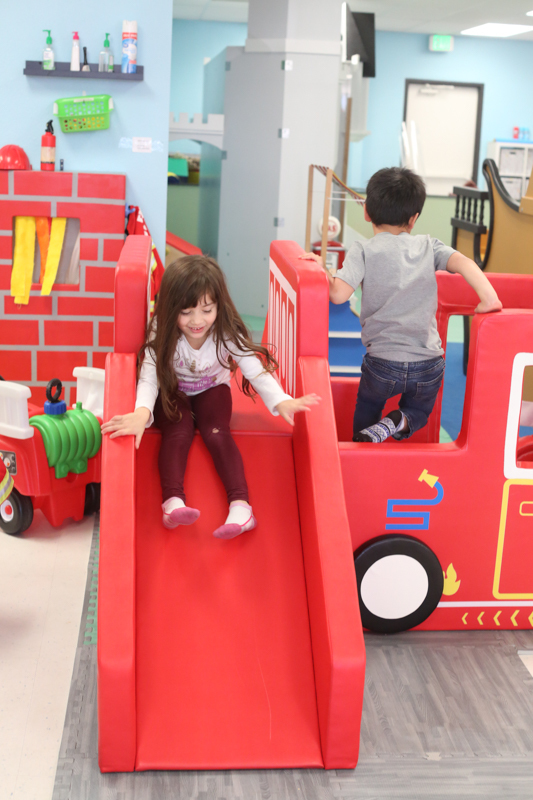 We’re so happy to announce our new infant play area for kids 35 months and under. 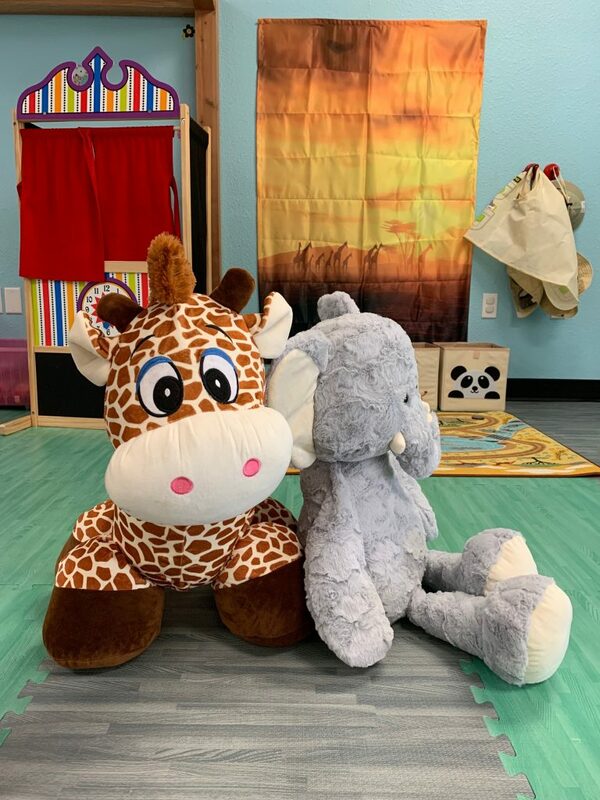 If you remember, when we started in 2017 our infant area was in the front of our eating area. We situated it there so it would be separated from the main floor, but it was problematic because of it’s size and it’s openness. 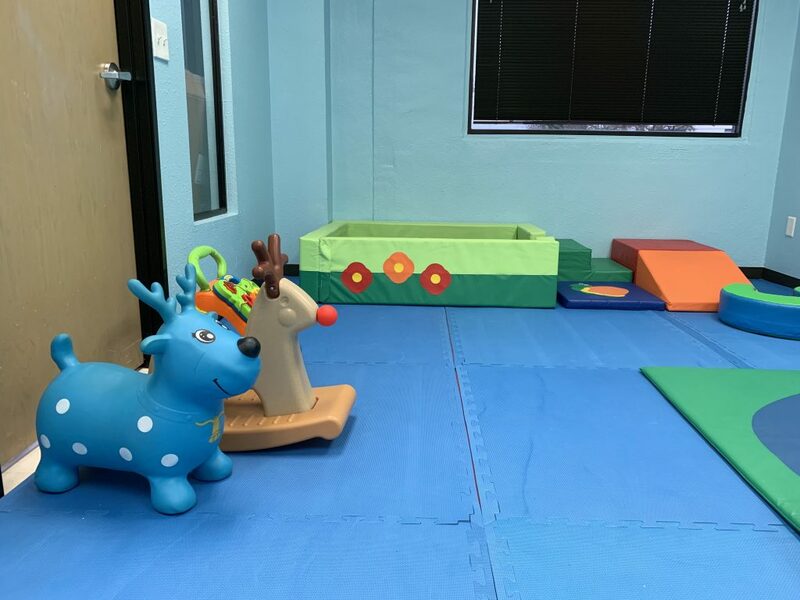 Finally after a year we have resolved this issue by taking away our smaller party room and creating a true infant area. 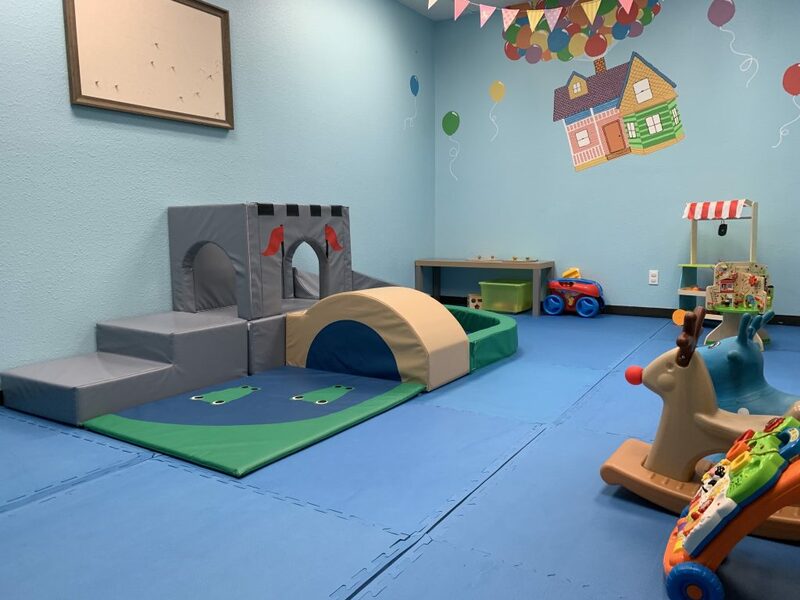 The room includes a soft play castle as a nod to our infamous play castle on our main floor. 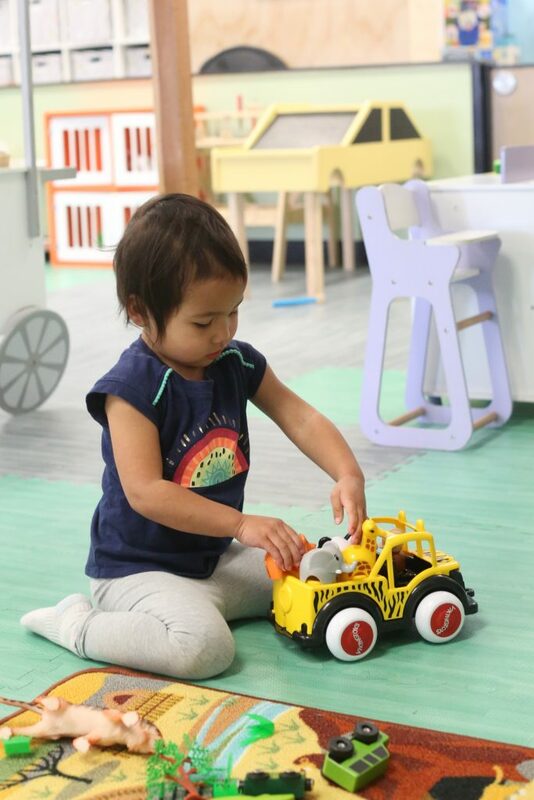 Items from the original infant area moved in too, such as our ball pool, building blocks, and walker toys. 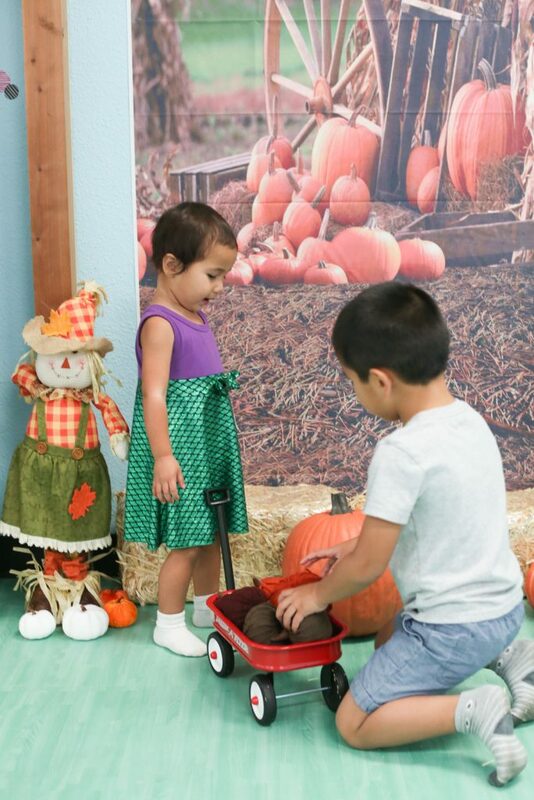 We included some riding toys such as a rocker and bouncer as well. On the other side you’ll find a very baby friendly market cart and a table with some knob puzzles and magnets. 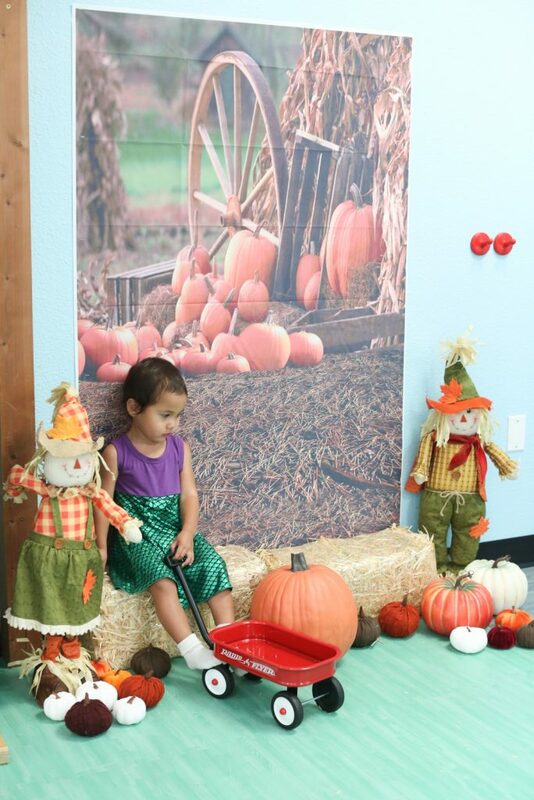 The room has turned out super cute and we love seeing families with little ones enjoy it. It’s about 90% complete. 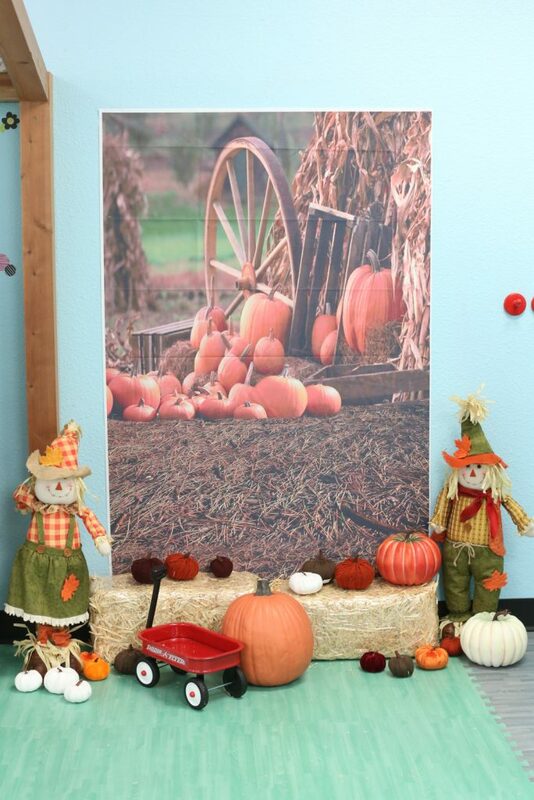 There are still some plans for more sensory friendly wall panels in the near future. 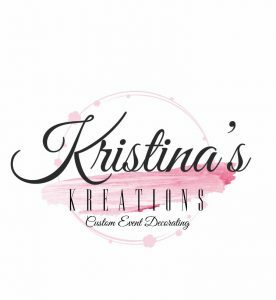 If you haven’t been in a while and you have a little one 35 months or under come and check out the new space. 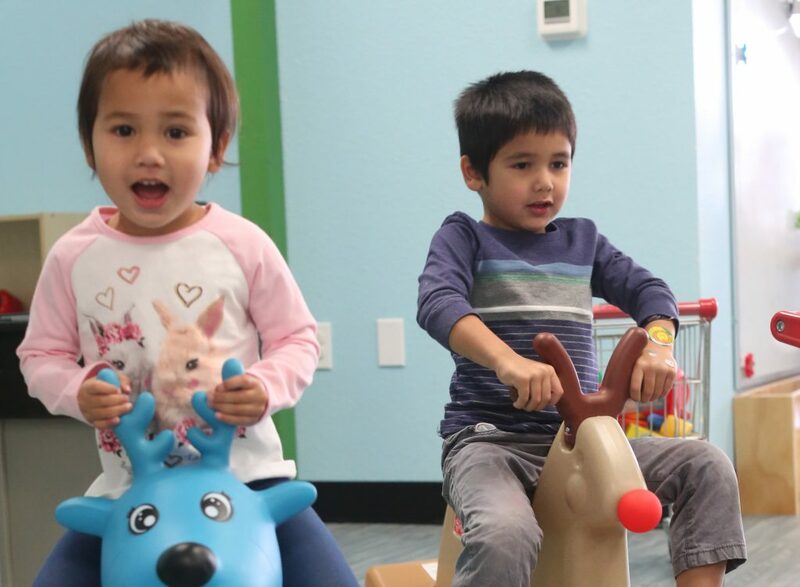 We’re excited for all the new changes come to Imagine Play in 2019. 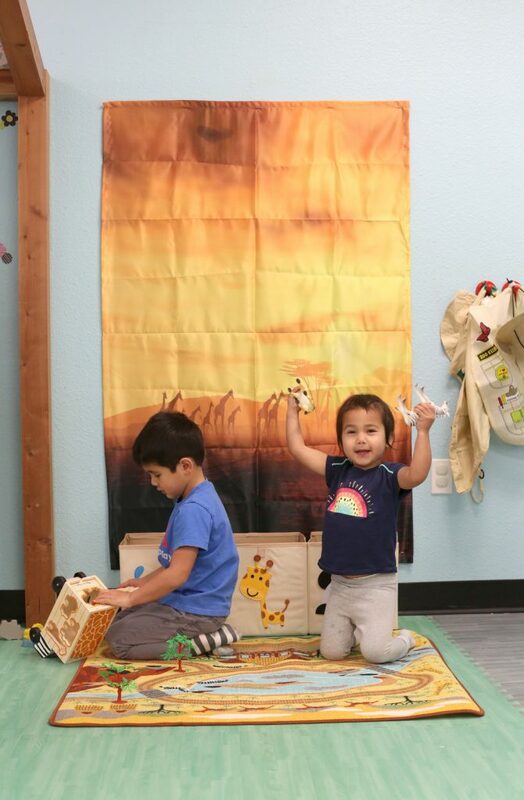 We’re having some animal fun for the beginning of the year with this Safari pretend play area. As you can see the kids are excited. 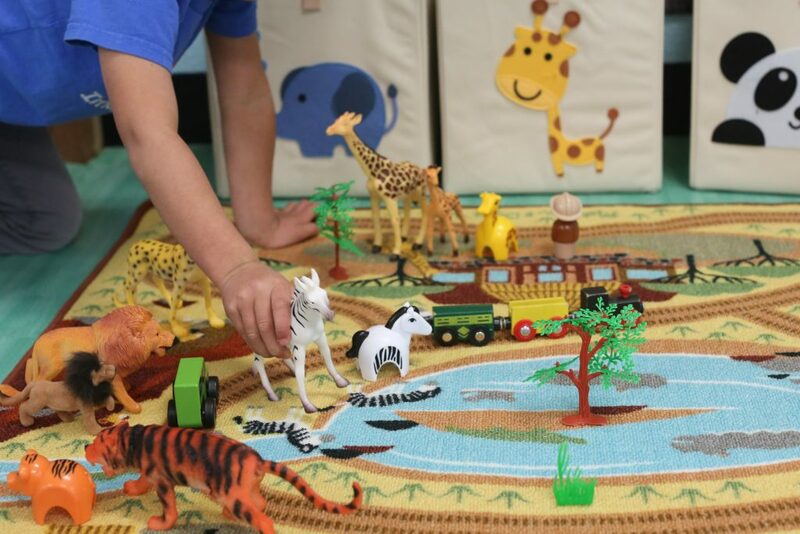 The main focal point of this play area is the safari rug. We included animal toys, of course, but we can also find cars, trains and trees. The play area has two safari trucks. 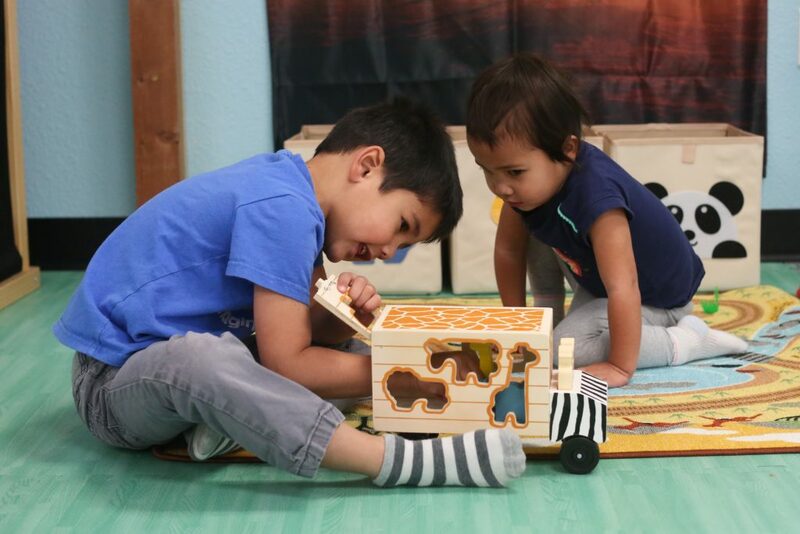 The kids can learn shape recognition with a puzzle inspired safari truck. The is another Safari jeep with a driver and various animals riding in the back. Other items in this play area include some dress up clothes and a couple of stuff animals with a bouncy giraffe. 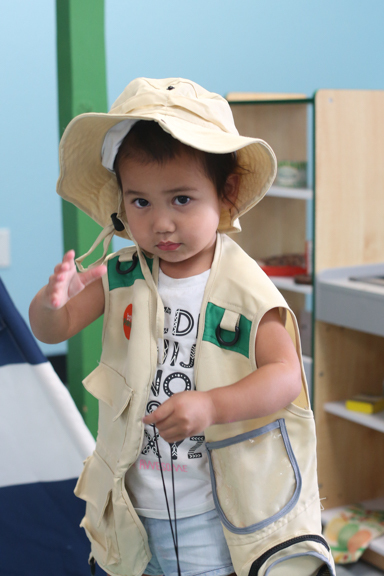 Kids will love pretending to be a safari adventurer. Ho ho ho! 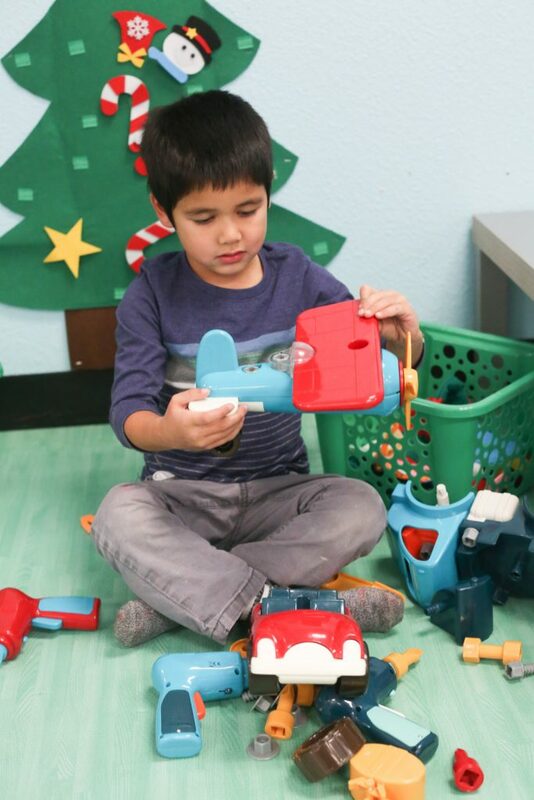 It’s time to get into the holiday spirit with Santa’s Workshop Pretend Play. Our play area changes every month, December is the month to merry and we want all your little Elves to join us for some festive fun. They can even dress the part with our elf and santa hats. 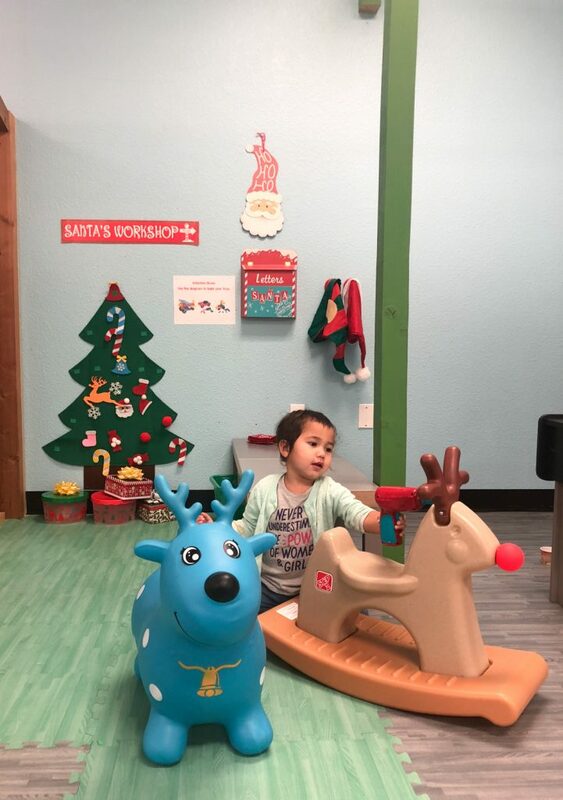 The workshop has all the components any little elf would love. 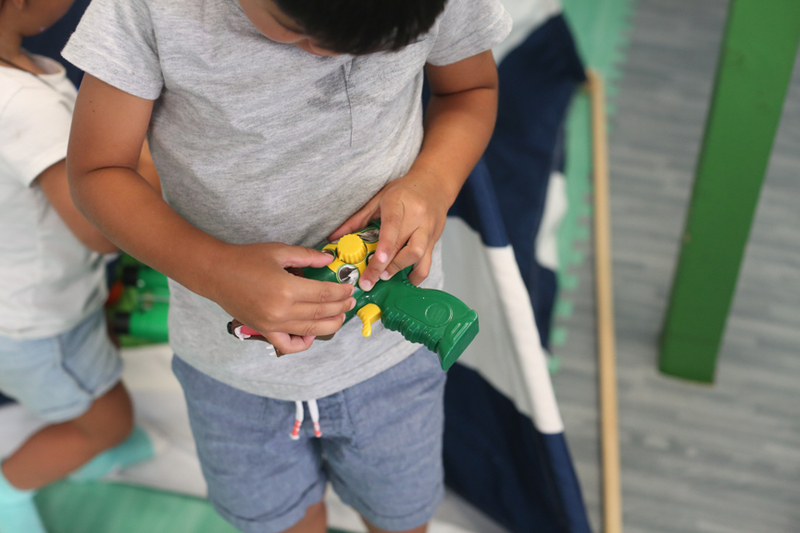 We love these take apart and build toys. 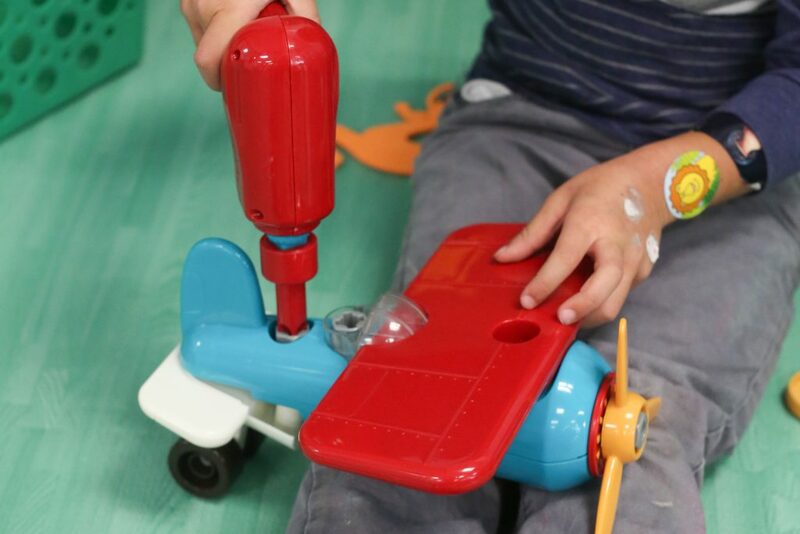 Your little one can build a plane, roadster or crane truck using a motorized drill and toddler friendly bolts and bits. 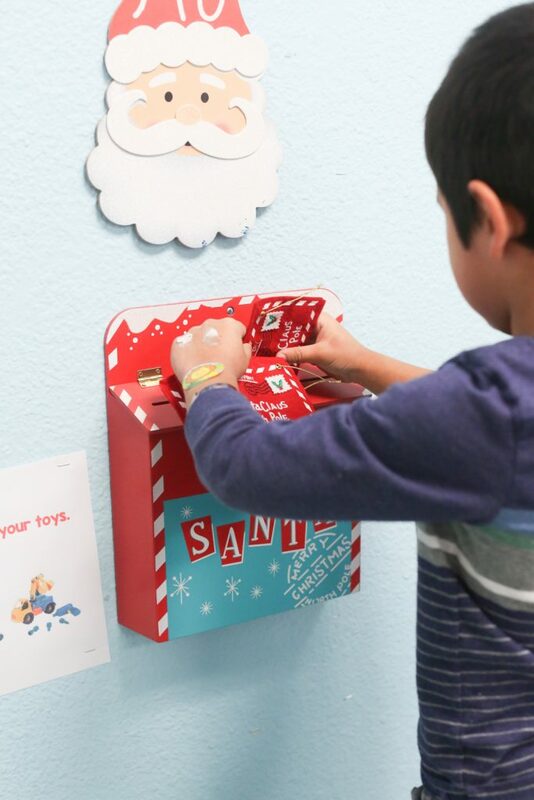 You can make a special deliver to Santa by mailing letters in our mailbox. 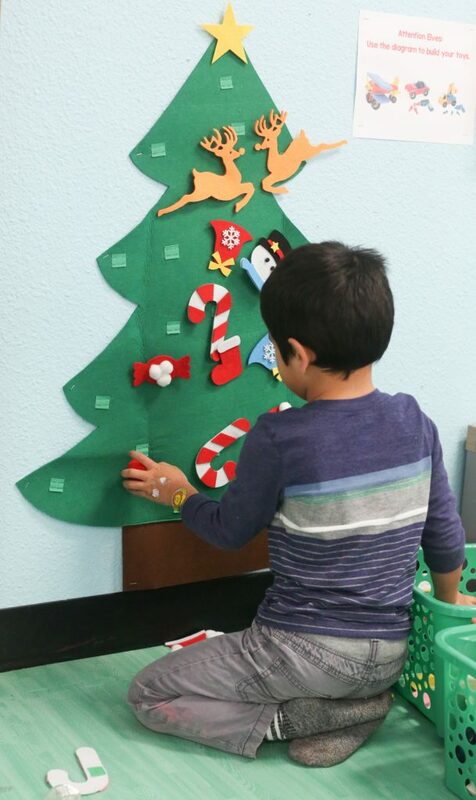 The kids can decorate the tree to their heart’s content by placing stick on ornaments on our felt tree. We have all types of ornaments like snowmen, candy canes and stockings. 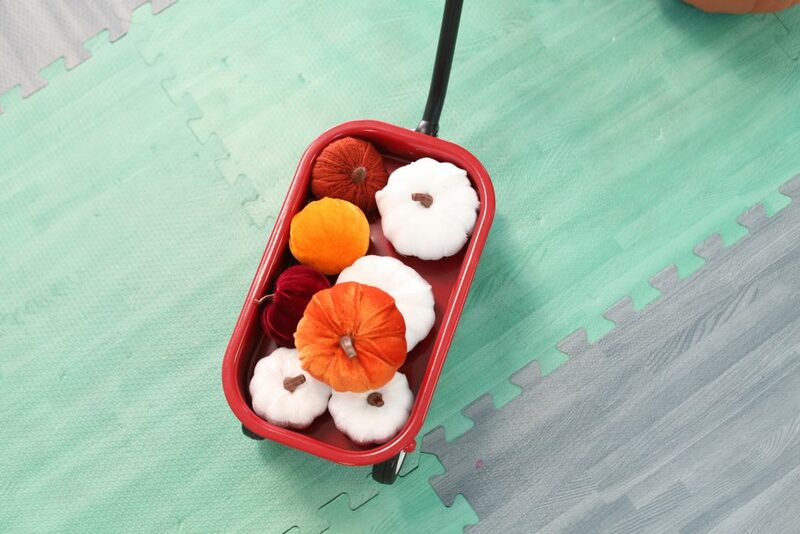 It’s much more than just decorating, it’s learning about shapes and objects. The best thing about being in the North pole is being able to ride a reindeer. We have ones you can bounce on. 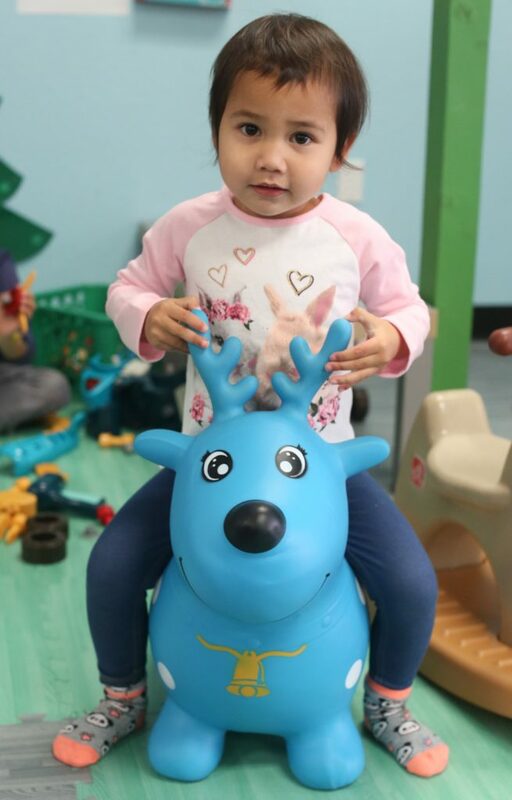 …and a red nosed reindeer you can rock on. 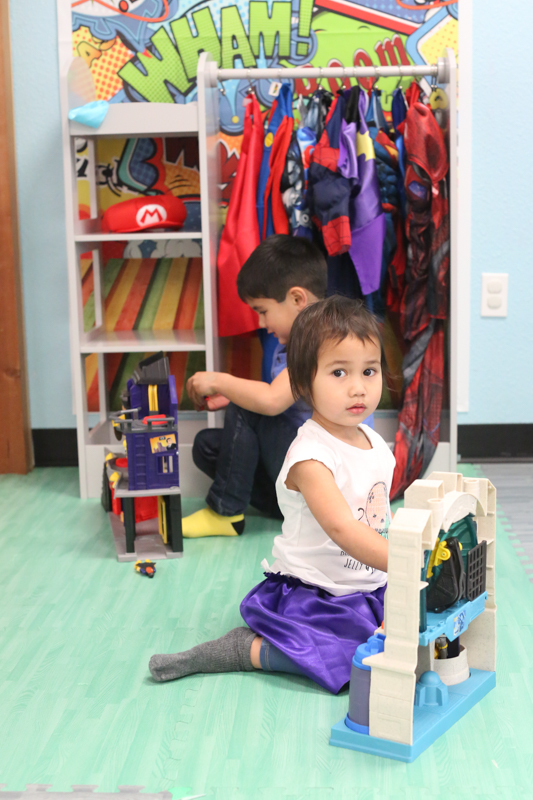 You can see videos of our pretend play are on our youtube channel. 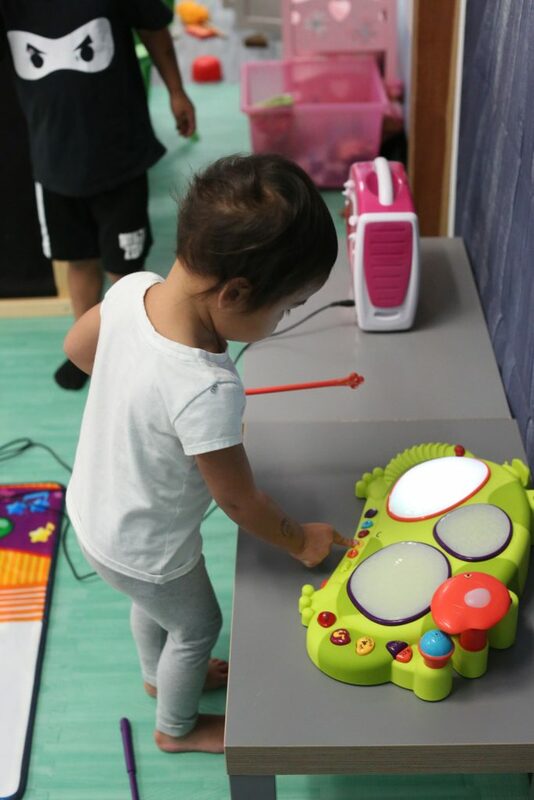 We’re making some noise over at Imagine Play this month with our Music Dramatic Play. 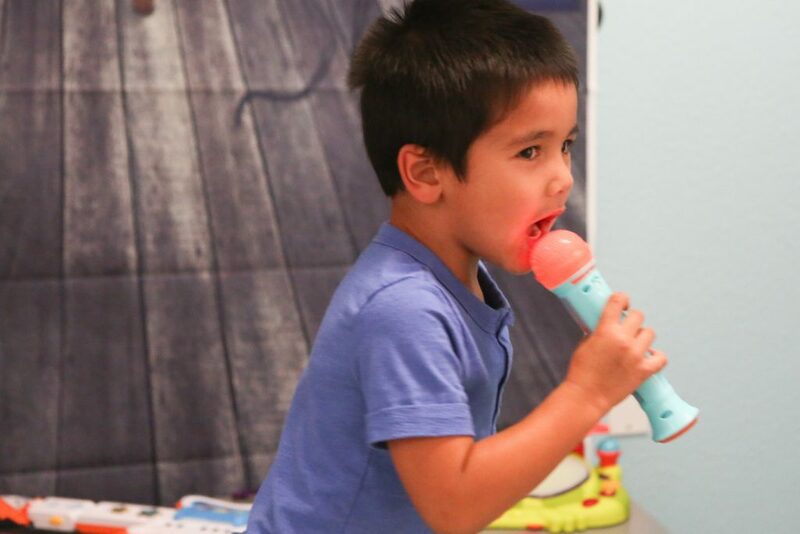 We know how much kids love to sing, dance and create. This month’s theme will fulfill the hearts of those creative minds. 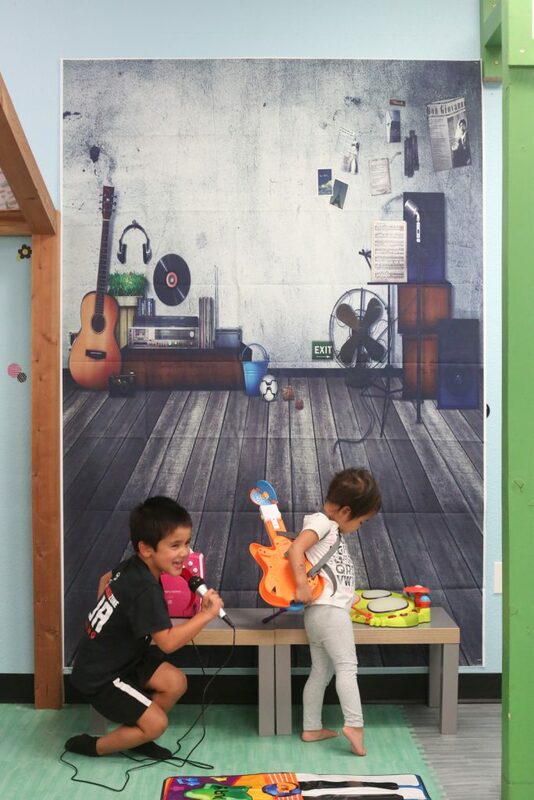 We start with a picture worthy musical backdrop. The back wall includes a Xylophone (not pictured) and a light up frog drum set. The kids can freestyle, but there is a also a game where they kids have to catch a fly by tapping the drum when they see the fly. 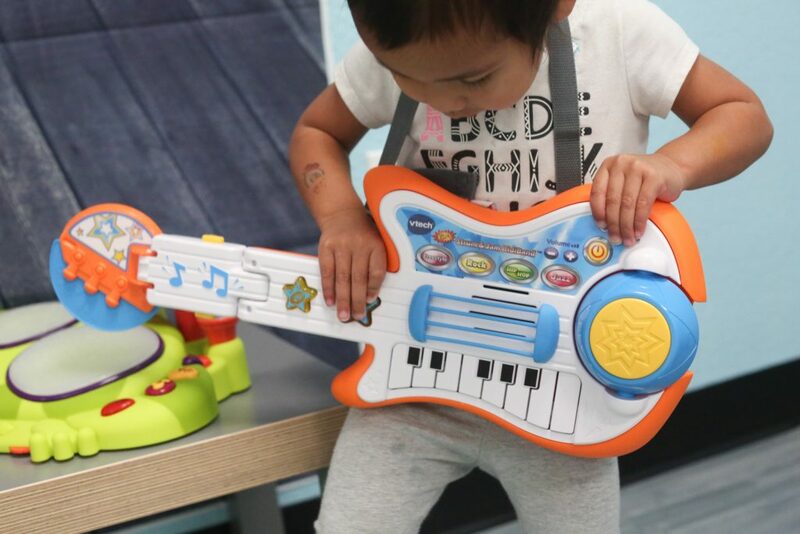 There is also a guitar the kids can wear and pretend to rock out. It plays different genres of music and has light up buttons. 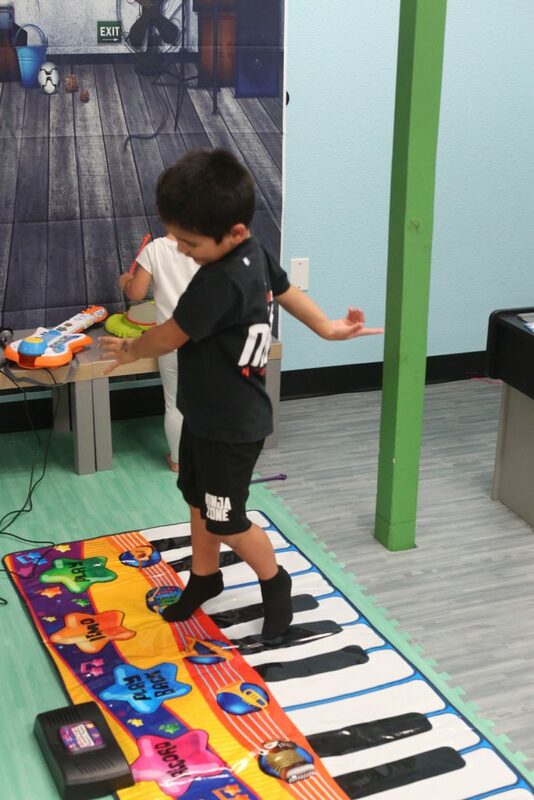 The kids love to dance on the giant floor piano. They can freestyle and also record a song and play it back. However, their favorite activity from the Music Dramatic Play is singing along to Moana and Elsa on these microphones. They can spend quite a while listening and following along to the words. 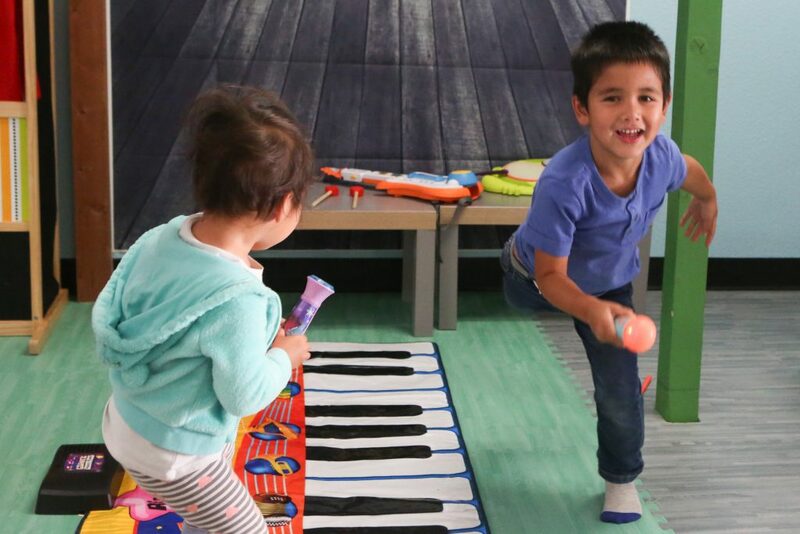 Come join us for Open Play this month to create music. 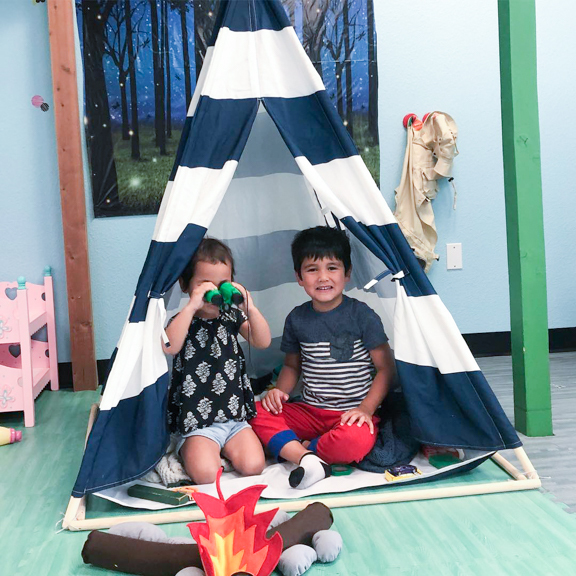 This month’s rotating theme in our play area is Camping pretend play. 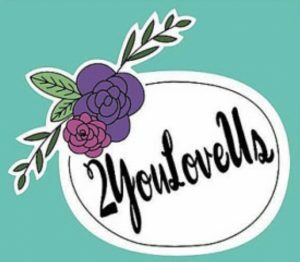 It’s our first theme that we are recycling as we approach our 1 year anniversary. 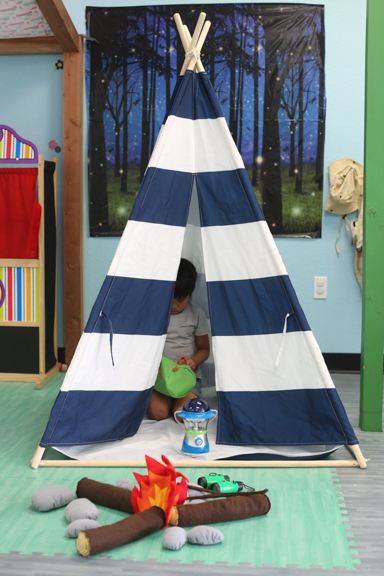 We re-used our camping tent, but have a bunch of new accessories for our camping theme too. 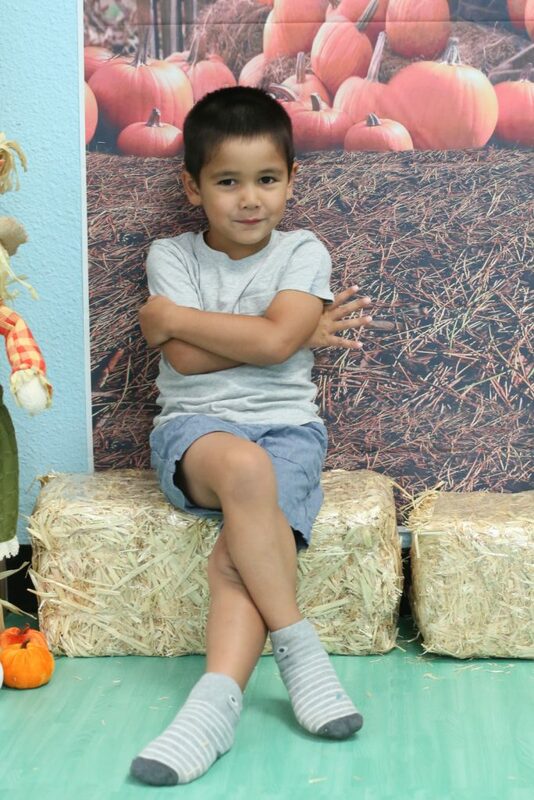 We included a woodsy backdrop to complete the camping atmosphere. You can’t go camping without looking the part. 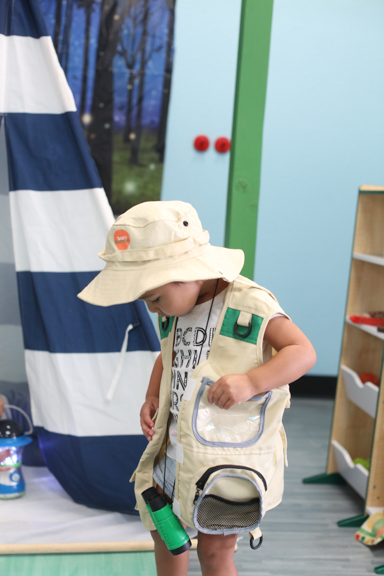 The kids can dress up in a adventure vest and hat. Don’t forget the binoculars for some bird watching. Listen and learn about the sound of animals in the wilderness with our animal caller. After sit around the camp fire and roast some marshmallows with your friends. 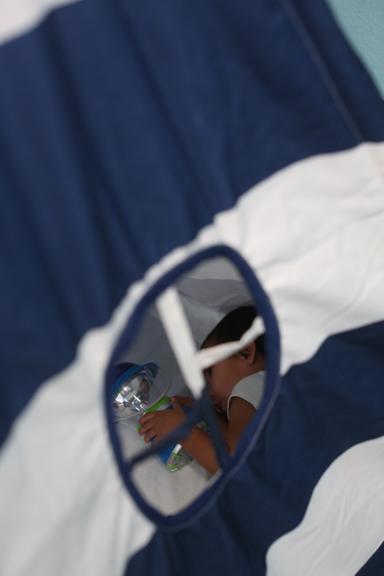 When they are tired they can gaze upon the stars in their tent. 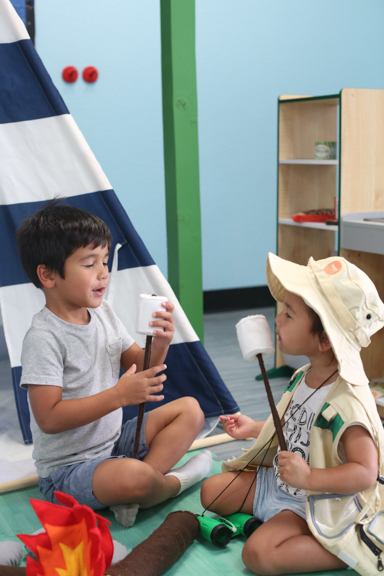 Come join us for camping pretend play soon.